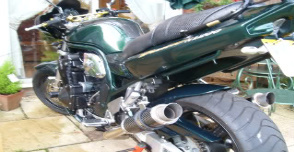 suzuki bandit forum :: The Marketplace :: Wanted! Hi guys I ride 2005 Bandit 1200S around the mountains of Pennsylvania, I've put 5000+miles on this year on the other motorcycle, a 94 seca II, good commuters both. anyways I'm mainly joining because I need some help. I gnarled the front end of the bandit last spring and now I'm looking to get it back on the road by next spring. Looking for parts bikes, front ends, and good deals in general.